Citation Information: J Clin Invest. 2006;116(5):1202-1209. https://doi.org/10.1172/JCI28551. Wnt proteins are a family of secreted proteins that regulate many aspects of cell growth, differentiation, function, and death. Considerable progress has been made in our understanding of the molecular links between Wnt signaling and bone development and remodeling since initial reports that mutations in the Wnt coreceptor low-density lipoprotein receptor–related protein 5 (LRP5) are causally linked to alterations in human bone mass. Of the pathways activated by Wnts, it is signaling through the canonical (i.e., Wnt/β-catenin) pathway that increases bone mass through a number of mechanisms including renewal of stem cells, stimulation of preosteoblast replication, induction of osteoblastogenesis, and inhibition of osteoblast and osteocyte apoptosis. 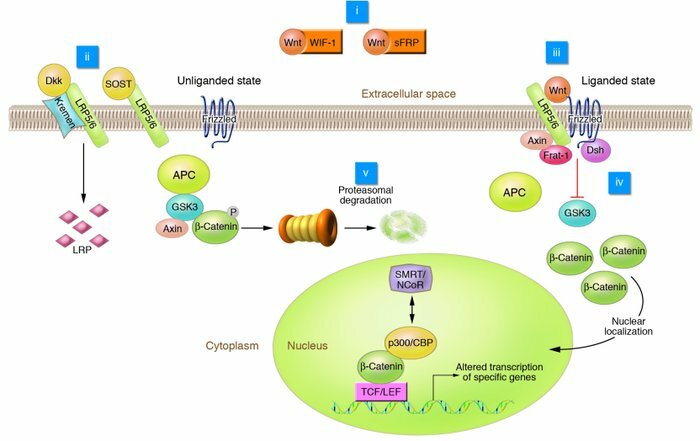 This pathway is an enticing target for developing drugs to battle skeletal diseases as Wnt/β-catenin signaling is composed of a series of molecular interactions that offer potential places for pharmacological intervention. In considering opportunities for anabolic drug discovery in this area, one must consider multiple factors, including (a) the roles of Wnt signaling for development, remodeling, and pathology of bone; (b) how pharmacological interventions that target this pathway may specifically treat osteoporosis and other aspects of skeletal health; and (c) whether the targets within this pathway are amenable to drug intervention. In this Review we discuss the current understanding of this pathway in terms of bone biology and assess whether targeting this pathway might yield novel therapeutics to treat typical bone disorders. In the liganded state, binding of Wnt to the frizzled receptor inhibits GSK3 activity through mechanisms involving Axin, Frat-1, and Disheveled (Dsh). β-Catenin accumulates and is translocated to the nucleus, where it binds to TCF/LEF, causing displacement of transcriptional corepressors (e.g., silencing mediator of retinoid and thyroid receptors and nuclear receptor corepressor; SMRT/NCoR) with transcriptional coactivators (e.g., p300 and cAMP response element–binding protein; p300/CBP). Wnt signaling can be blocked by interactions of Wnt with inhibitory factors including WIF-1 and sFRP or the interaction of LRP5/6 with the Dkk/Kremen complex or sclerostin (SOST gene product). Phosphorylation of β-catenin by GSK3 stimulates β-catenin degradation. Potential intervention points for drug therapy (i–v) are indicated.